Used, very good. 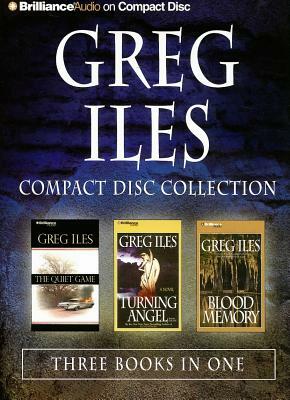 5 mass market paperback by Greg Iles in Very Good condition. Includes: BLACK CROSS, FOOTPRINTS OF GOD, MORTAL FEAR, QUIET GAM, SLEEP NO MORE. **Oversize. **We provide professional service and individual attention to your order, daily shipments, and sturdy packaging. FREE TRACKING ON ALL SHIPMENTS WITHIN USA. Used, very good. 14 mass market paperback by Greg Iles in Very Good condition. Includes: 24 HOURS, BLACK CROSS, BLOOD MEMORY, BONE TREE, DEVIL'S PUNCHBOWL, FOOTPRINTS OF GOD, MISSISSIPPI BLOOD, MORTAL FEAR; NATCHEZ BURNING, QUIET GAME, SLEEP NO MORE, SPANDAU PHOENIX, TRUE EVIL, TURNING ANGEL. ** Heavy/Oversize **We provide professional service and individual attention to your order, daily shipments, and sturdy packaging. FREE TRACKING ON ALL SHIPMENTS WITHIN USA.